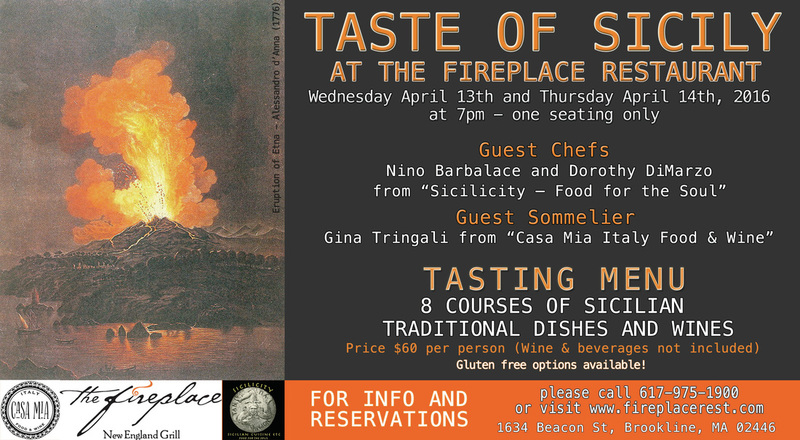 Please join Sicilicity - Food for the Soul and ﻿Casa Mia Italy Food and Wine﻿ for a special event Taste of Sicily at the Fireplace Restaurant in Brookline. The event takes place on Wednesday April 13th and Thursday April 14th, starting at 7 pm. Reserve your space soon as spaces are limited. Guest Chefs Nino Barbalace and Dorothy DiMarzo will be cooking an 8 course menu of traditional Sicilian dishes. Guest sommelier Gina Tringali will be on site to introduce a small selection of Sicilian wines.